That’s what they say so that’s what we did. I’d guess a couple of acres, possibly a bit more, of grass cut by tractor on Saturday the 30th. And just like when lighting the BBQ or forgetting your umbrella it decided to rain, despite a clear 10 day weather forecast. This changed our schedule a little and the hay had to be left to dry until Monday when we turned it all by hand, an all day job, as our neighbour with the tractor was working his 24 hour shift at the garage. No sooner had we finished then another storm crept in, dropped a few more buckets of water on the hay and moved on. 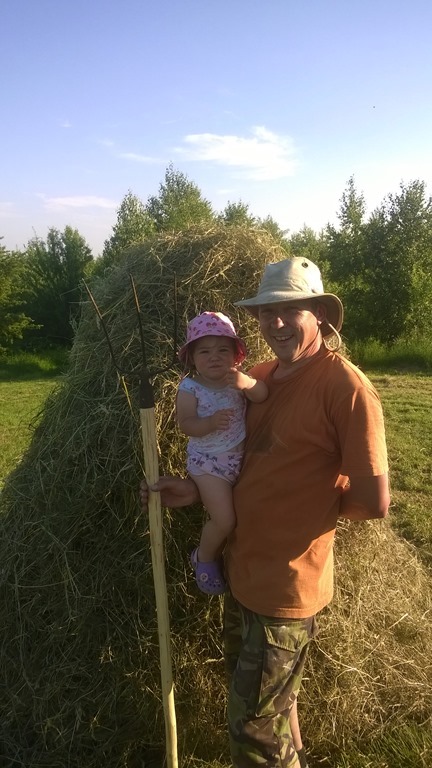 Thankfully we have had temperatures close to 30c (86f) most of the week and Kazek turned up a couple of times a day with tractor and hay turning machine thingy, and so on Wednesday we piled the first nine stacks. No bales here, just odd shaped domes of fresh, sweet smelling hay. Apparently the way the hay is stacked varies from region to region, with that in mind I think I have invented a new way, although I doubt it’s a style that will catch on. We will be putting it in the barn today along with the hay from the bottom fields that we have left in windrows as the weather stayed fine. We probably have have twice as much as we need for the Sunday and Monday (the goats) but then who knows what else will be eating it come the winter. A rare appearance from me next to the last and smallest stack of the day. I could never have done it without Malina! 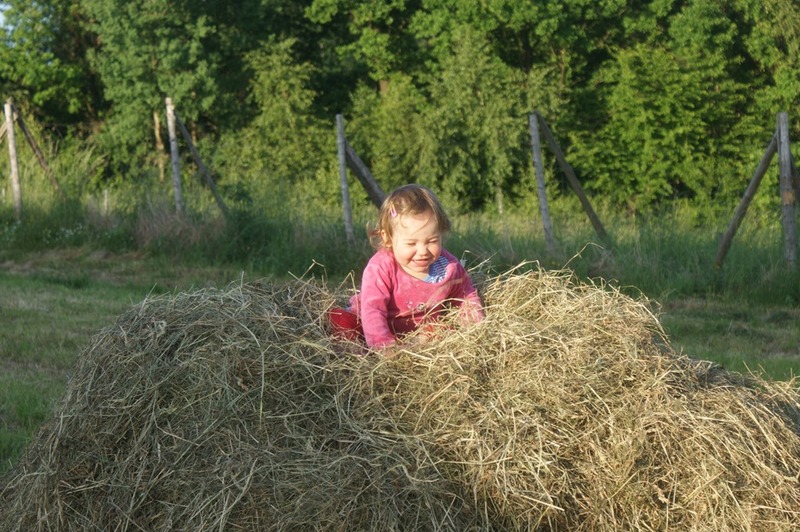 Look daddy, look what’s happened to that nice hay stack. Room for two more? it’s just a couple of kids! Gosia and I often talk of livestock; what to get and more importantly when to get it and with spring sprung the choice of young stock is at it’s height. We had some success with lambs a few years ago, but then we put things on hold as we put our energy into the house and of course Malina! Now we have the chickens and following the progress across at Farma Sadlowo we decided it was time to take the plunge. We have considered a cow for a couple of years, heading towards the Dexter as a more manageable breed with its diminutive size, but a cow is a massive investment and unless you have something to do with all the milk can they be a waste of valuable time and resources, and so, like Terry and Marta we opted for a couple of goats. As heard animals you are advised to always get at least two, and as the future plan is to milk them it seemed like two young does would be the answer. 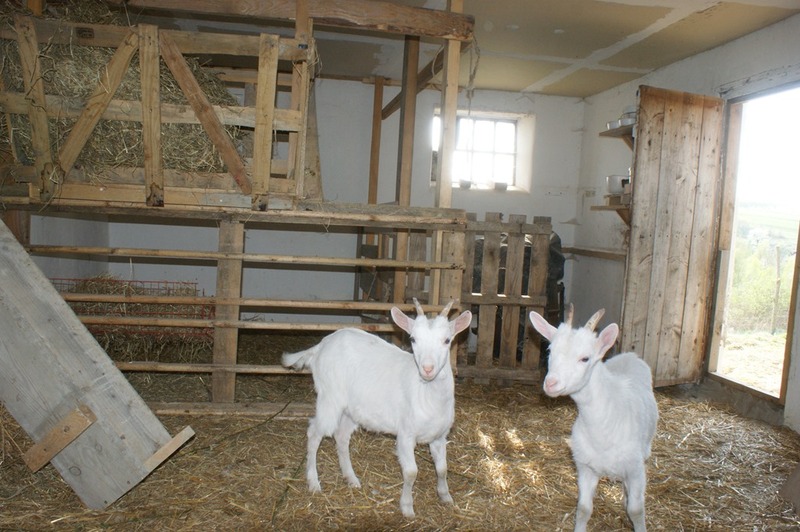 We decided on young goats so that we can train and tame them to make life easier for us in the future. We will also be free of the milking task until next year, given us the much needed time to finish the house and open up for business. Well at least that’s the plan! I had already taken the hammer, saw and cordless drill down to the stable and after explaining to the chickens what was going on they agreed to give up a section of the holiday let to some new guests. Six pallets, a set of hinges and an old Snickers (Marathon to me) display tray to catch any stray hay and we were in business to take in the new residents. A short drive, two dog leads and five bales of straw in the van and we shuck hands on the deal. You may recall that the hens had already outgrown there purpose built enclosure so I was glad to give it a new purpose, and after the second day we let the little ladies out to take on the grass that the hens had refused or failed to eat. And there you have it, two more mouths to feed, but they fit in well with the morning and evening ritual, enjoying extra treats of willow branches cut from any tree I happen to pass on the journey and a handful of oats first and last thing to help to make friends. They already come running when they hear my voice and Gosia and Malina have also bonded with buckets of fresh picked grass. It’s almost two weeks since we picked up the goats, from this day forward to be known as Sunday and Monday. It should have been Sandy and Mandy, but I misheard Gosia (no she doesn’t have a cockney accent) and by the time she noticed that I had given them different names it was too late. Despite that I thought it would make naming the next five easier and who knows it could be the birth of the ‘Happy Days Milking Company’! Gosia didn’t get it either. Anyhow, the update is to report that they too have outgrown the holding pen and after a weeks work, forty three posts, one hundred and thirty five meters of wire fencing and an additional gate, I released them onto the bottom pasture. Lots of lovely spring grass and weeds, wild raspberry canes, sloe and hazel trees poking through or overhanging the fence. A goats paradise? Apparently not as they found a gap in my yet to be fixed gate and headed off on a mission for some clumps of grass they spotted on an earlier bid for freedom. Thankfully a willow branch laden with fresh leaves and a ‘come on girls’ and they were back in the fold. Sometimes I wonder if these animals appreciate the work I put in for them! 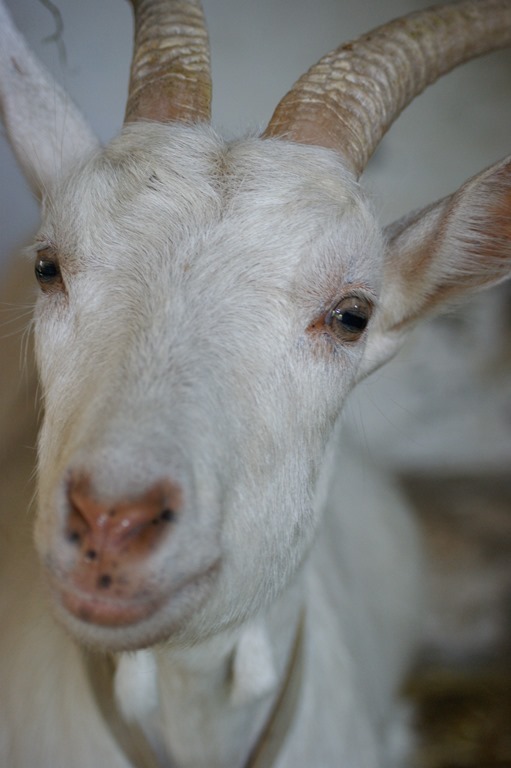 Author Eddy WinkoPosted on May 3, 2015 Categories self sufficiencyTags goats, livestock21 Comments on Room for two more? it’s just a couple of kids!